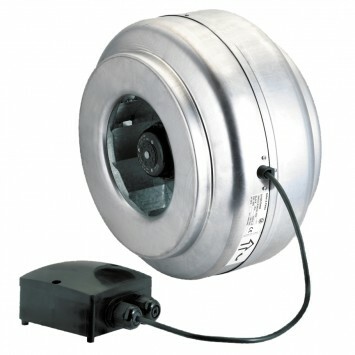 Range of in-line duct centrifugal fans, manufactured from high grade corrosion resistant pressed galvanised steel and supplied as standard with a prewired wiring junction box and a robust mounting foot. All model include an enclosed type, single-phase external rotor motor with factory matched backward curved nonstalling impeller. (1) Models 355 and 400 are manufactured in sheet steel protected against corrosion by cataforesis primer and black polyester paint finish. 100 ﾖ 315 models: Motors are single phase or three phase (models 355 and 400), with ball bearings and safety thermal overload protection. ﾓLﾔ version: High performance models. ﾓBﾔ Version: Standard performance models for lower noise level requirements. Impellers from 100 to 160 models are manufactured from injection moulded plastic.